In this week’s study from Tehillim / Psalms 73:1-28, the psalm opens saying, א מִזְמוֹר לְאָסָף אַךְ טוֹב לְיִשְֹרָאֵל אֱלֹהִים לְבָרֵי לֵבָב: A psalm of Asaph. 73:1 Surely God is good to Israel, To those who are pure in heart! (NASB) Who is Asaph? He continues saying, ב וַאֲנִי כִּמְעַט נָטָוֻי [נָטָיוּ] רַגְלָי כְּאַיִן שֻׁפְּכֻה [שֻׁפְּכֻו] אֲשֻׁרָי: ג כִּי-קִנֵּאתִי בַּהוֹלְלִים שְׁלוֹם רְשָׁעִים אֶרְאֶה: ד כִּי אֵין חַרְצֻבּוֹת לְמוֹתָם וּבָרִיא אוּלָם: ה בַּעֲמַל אֱנוֹשׁ אֵינֵמוֹ וְעִם-אָדָם לֹא יְנֻגָּעוּ: 73:2 But as for me, my feet came close to stumbling, My steps had almost slipped. 73:3 For I was envious of the arrogant As I saw the prosperity of the wicked. 73:4 For there are no pains in their death, And their body is fat. 73:5 They are not in trouble as other men, Nor are they plagued like mankind. (NASB) He continues saying that they adorn themselves with pride and violence (73:6) and that their eyes bulged with fatness (73:7). What is the significance of eyes that bulge with fatness? The unrighteous mock (73:8), speak against the heavens (73:9), and question whether God knows and where is knowledge of God (73:11). Asaph speaks of the wicked who are at ease and increase in wealth (73:12), and it is as if he has kept his heart pure in vane (73:13) because of his hardship (73:14-15). He continues saying, טז וַאֲחַשְּׁבָה לָדַעַת זֹאת עָמָל היּא [הוּא] בְעֵינָי: יז עַד-אָבוֹא אֶל-מִקְדְּשֵׁי-אֵל אָבִינָה לְאַחֲרִיתָם: 73:16 When I pondered to understand this, It was troublesome in my sight 73:17 Until I came into the sanctuary of God; Then I perceived their end. (NASB) He says the Lord has placed the wicked in slippery places, (73:18), and the Lord will cause them to be swept away (73:19), and they will be like a dream that will pass away (73:20). He says that he was pierced within (73:21), and like an animal before God (73:22). Nevertheless, he continued to serve the Lord (73:23, כג וַאֲנִי תָמִיד עִמָּךְ אָחַזְתָּ בְּיַד-יְמִינִי:). Asaph concludes his psalm saying, כד בַּעֲצָתְךָ תַנְחֵנִי וְאַחַר כָּבוֹד תִּקָּחֵנִי: כה מִי-לִי בַשָּׁמָיִם וְעִמְּךָ לֹא-חָפַצְתִּי בָאָרֶץ: כו כָּלָה שְׁאֵרִי וּלְבָבִי צוּר-לְבָבִי וְחֶלְקִי אֱלֹהִים לְעוֹלָם: כז כִּי-הִנֵּה רְחֵקֶיךָ יֹאבֵדוּ הִצְמַתָּה כָּל-זוֹנֶה מִמֶּךָּ: כח וַאֲנִי | קִרֲבַת אֱלֹהִים לִי-טוֹב שַׁתִּי | בַּאדֹנָי יְהוִֹה מַחְסִי לְסַפֵּר כָּל-מַלְאֲכוֹתֶיךָ: 73:24 With Your counsel You will guide me, And afterward receive me to glory. 73:25 Whom have I in heaven but You? And besides You, I desire nothing on earth. 73:26 My flesh and my heart may fail, But God is the strength of my heart and my portion forever. 73:27 For, behold, those who are far from You will perish; You have destroyed all those who are unfaithful to You. 73:28 But as for me, the nearness of God is my good; I have made the Lord God my refuge, That I may tell of all Your works. (NASB) Asaph speaks of being taken to glory. Is this a belief that when one dies, they are taken to heaven? (Shekhinah) The one who has made the Lord his refuge will be able to speak of the glory and work of the Lord God in heaven! In this week’s study from Tehillim / Psalms 73:1-28, the psalm opens saying, א מִזְמוֹר לְאָסָף אַךְ טוֹב לְיִשְֹרָאֵל אֱלֹהִים לְבָרֵי לֵבָב: A psalm of Asaph. 73:1 Surely God is good to Israel, To those who are pure in heart! (NASB) Who is Asaph? There are 12 psalms which are attributed to Asaph, Tehillim / Psalms 50, and 73-83 in the MT, and as 49 and 72-82 in the Septuagint. According to the Scriptures, the Asaphites were identified as the singers during the Temple service. As a result, Scholars have suggested that a psalm that is attributed to Asaph could mean that this psalm is for the Asaphites to sing that was written by David. Another possibility may be that Asaph was the author or the transcriber of these psalms, that he wrote down the psalm for David. The issue with this perspective is the end of the previous psalm (Tehillim / Psalms 72) states this is the end of David’s psalms. In the Tanach there are three different men with the name of Asaph. The Asaph who is identified with these twelve Psalms is said to be the son of Berechiah which is said to be an ancestor of the Asaphites. More information may be gathered from 1st and 2nd Chronicles, which state that Asaph was a descendant of Gershom the son of Levi and therefore he is identified as a member of the Levites. He is also known as one of the three Levites commissioned by David to be in charge of singing in the house of the Lord. In 1 Chronicles 6:39, David appoints a man named Heman as the main musician or singer and Asaph to be at Heman’s right hand man and the Merarites were to be at Heman’s left hand. In addition, Asaph is credited with performing at the dedication of Solomon’s temple according to 2 Chronicles 5:12. The time frame for Asaph’s service, he would have served as an official during King David’s time, and during his son King Solomon’s reign as well. As a result, he would have witnessed the best and the worst of the leadership in Israel, giving him the ability to complain against the corruption, which may be what Asaph was trying to say in Tehillim / Psalms 73. Asaph may be describing these corrupt officials in this psalm. Asaph opens the psalm saying, אַךְ טוֹב לְיִשְֹרָאֵל אֱלֹהִים לְבָרֵי לֵבָב: 73:1 Surely God is good to Israel, To those who are pure in heart! (NASB) Asaph speaks of the Lord being good to Israel and to those who are pure in heart. Notice how he does not use the word טהור as a reference to ritual purity, meaning as an adjective “pure, clean, fine, white, unblemished,” or as a noun “purification, cleansing, sanctification, purgation,” as David did in his psalms (יב לֵב טָהוֹר בְּרָא-לִי אֱלֹהִים וְרוּחַ נָכוֹן חַדֵּשׁ בְּקִרְבִּי:, 51:10 Create in me a clean heart, O God, And renew a steadfast spirit within me. NASB). By not using the word Tahor (טהור), Asaph is not drawing a parallel to the ritual service of the Lord in one’s heart. David does however say in his psalm, ג מִי-יַעֲלֶה בְהַר יְהֹוָה וּמִי-יָקוּם בִּמְקוֹם קָדְשׁוֹ: ד נְקִי כַפַּיִם וּבַר לֵבָב אֲשֶׁר לֹא-נָשָֹא לַשָּׁוְא נַפְשִׁי וְלֹא נִשְׁבַּע לְמִרְמָה: 24:3 Who may ascend into the hill of the Lord? And who may stand in His holy place? 24:4 He who has clean hands and a pure heart, Who has not lifted up his soul to falsehood And has not sworn deceitfully. (NASB) The one who is worthy to ascend the mountain of the Lord, is the one who has worthy (בַר) hands, the NASB translates the MT to say, “he who has a pure heart” (וּבַר לֵבָב) using the word בר, and “clean or tidy lips” (נְקִי כַפַּיִם) In a similar way, Asaph says לְבָרֵי לֵבָב from the root בר meaning “able, worthy of, or deserving,” “Surely God is good to Israel, To those who are pure in heart!” The purity or uprightness of the heart is the main focus point of Tehillim / Psalms 73; Asaph discusses how the righteous are to respond to the corruption of the wealthy and those who have influence and power in the leadership of Israel. The conclusion is that based upon the Character of God, His Holiness, Righteousness, Truthfulness, and Justice, the wicked who corrupt their ways and use their power to harm the innocent and poor will receive his rewards at the hand of the Lord. Both the Aramaic Targum and the Septuagint are in agreement with the MT saying, א תושבחתא על ידיה דאסף ברם טב לישראל אלהא לברירי ליבא׃ 73:1 A psalm composed by Asaph. Truly God is good to Israel, to the pure of heart. (EMC) and, 73:1 ψαλμὸς τῷ Ασαφ ὡς ἀγαθὸς τῷ Ισραηλ ὁ θεός τοῖς εὐθέσι τῇ καρδίᾳ ἐμοῦ δὲ παρὰ μικρὸν ἐσαλεύθησαν οἱ πόδες πα ὀλίγον ἐξεχύθη τὰ διαβήματά μου A Psalm for Asaph. 73:1 How good is God to Israel, to the upright in heart! (LXX). The Aramaic Targum translates the MT saying the Lord is good to those who are “clear, pure, shining brightly, clear, obvious, valid, or truthful of heart” (לברירי ליבא). The importance of this opening verse is related to the one who has the right motivation in seeking the Lord. Does one have pure intentions, or is one motivated by the lust of the flesh, the pride of life, or some other selfish reason? Asaph continues saying, ב וַאֲנִי כִּמְעַט נָטָוֻי [נָטָיוּ] רַגְלָי כְּאַיִן שֻׁפְּכֻה [שֻׁפְּכֻו] אֲשֻׁרָי: ג כִּי-קִנֵּאתִי בַּהוֹלְלִים שְׁלוֹם רְשָׁעִים אֶרְאֶה: ד כִּי אֵין חַרְצֻבּוֹת לְמוֹתָם וּבָרִיא אוּלָם: ה בַּעֲמַל אֱנוֹשׁ אֵינֵמוֹ וְעִם-אָדָם לֹא יְנֻגָּעוּ: 73:2 But as for me, my feet came close to stumbling, My steps had almost slipped. 73:3 For I was envious of the arrogant As I saw the prosperity of the wicked. 73:4 For there are no pains in their death, And their body is fat. 73:5 They are not in trouble as other men, Nor are they plagued like mankind. (NASB) The Psalmist states that he had come close to stumbling (כִּמְעַט נָטָוֻי [נָטָיוּ] רַגְלָי) and had almost slipped because he was envious of the arrogant and saw the prosperity of the wicked. Asaph says that the life of the wicked, they do not suffer pain in death and their bodies are fat (a reference to being well fed and prosperous). The wicked do not suffer loss and are not plagued like mankind. Because of these things, their pride is their necklace and the garment of violence covers them, their eyes bulge because of their prosperity and in their arrogance the imaginations of their heart runs wild. What is the meaning of the “bulging eyes” of the wicked as compared to “the eye that wastes away” of the afflicted? (see Tehillim / Psalms 6:7-9) The wicked say to themselves according to Tehillim / Psalms 10:6, ו אָמַר בְּלִבּוֹ בַּל-אֶמּוֹט לְדֹר וָדֹר אֲשֶׁר לֹא-בְרָע: 10:6 He says to himself, ‘I will not be moved; Throughout all generations I will not be in adversity.’ (NASB) He says in his heart (אָמַר בְּלִבּוֹ) that he will not be moved (בַּל-אֶמּוֹט) from generation to generation and there will be no evil (אֲשֶׁר לֹא-בְרָע). The Aramaic translation states ו יימר בלבביה בלביה לא אזוע מדר לדר מלמעבד ביש׃ 10:6 He will say in his heart, “I will not be shaken from doing evil for all generations.” (EMC) and the Septuagint states 10:6 εἶπεν γὰρ ἐν καρδίᾳ αὐτοῦ οὐ μὴ σαλευθῶ ἀπὸ γενεᾶς εἰς γενεὰν ἄνευ κακοῦ 10:6 For he has said in his heart, I shall not be moved, continuing without evil from generation to generation. (LXX) Based upon the interpretation of David’s words, the rabbis translate Tehillim / Psalms 10:6 saying the arrogance of the wicked is so great that they believe they will not be moved through all generations and will not see evil or adversity. This is synonymous to the unrighteous man saying in his heart that he will not be shaken from doing evil for all generations. The unrighteous will continue in their evil deeds from generation to generation, the sons will learn their fathers unrighteous deeds and pass their evil ways down from generation to generation. The unrighteous continue in their sin by reason of Tehillim / Psalms 7:15 which states, טז בּוֹר כָּרָה וַיַּחְפְּרֵהוּ וַיִּפֹּל בְּשַׁחַת יִפְעָל: יז יָשׁוּב עֲמָלוֹ בְרֹאשׁוֹ וְעַל-קָדְקֳדוֹ חֲמָסוֹ יֵרֵד: 7:15 He has dug a pit and hollowed it out, And has fallen into the hole which he made. 7:16 His mischief will return upon his own head, And his violence will descend upon his own pate. (NASB) The unrighteous man is unrepentant, he has trapped himself, he has dug a pit and has fallen into the hole that he has made and he continues in his ways because he is unable to recognize the error of his own ways (he is unable to climb out of the pit he has dug). The rabbis say according to the Aramaic Targum, ב ואנא כזעיר פון אתמוטטא ריגלי כלמא דאזדעזעא איסתוורי׃ ג ארום טננית במתלעביא בעידן די שלם רשיעיא אחמי׃ ד ארום ליתיהון תווהין ומצטערין מטול על יום מיתתיהון איתבעיין מחשבתהון ופטים ואלים לבהון׃ ה בליעות גברין דמתעסקין באוריתא ליתיהון לעיין ועם בני נשא צדיקי דסבלין ייסורי איסורי לא ליתיהון מתכתשין׃ 73:2 But I – my feet had almost slipped; my steps had all but faltered. 73:3 For I became jealous of the mockers whenever I would see the welfare of the wicked. 73:4 For they are not dismayed and daunted by the day of their death; their opinions are sought out, and their heart is fat and strong. 73:5 They do not toil with the toil of men who are occupied with Torah; and they are not smitten with the righteous sons of men who endure sufferings. (EMC) They say essentially the same thing, that Asaph is saying his feet almost slipped due to jealousy of those who mock and the welfare of the wicked. They add in Tehillim / Psalms 73:5 that the wicked do not toil with the toil of men who occupy themselves with Torah and that they are not smitten with the righteous sons of men who endure sufferings. What does this statement mean, that those who study the Torah are smitten and endure sufferings? This suggests that our studying God’s Word and living by God’s Word, we will endure sufferings as a result. On the one hand, our enemies will see our righteous deeds and persecute us as a result. On the other hand, the Lord is working in our lives to draw us to Himself, to correct and reprove us for our sins, etc, these things may lead to sufferings in this life. Or in other words, we will endure sufferings for the glory of God, and for Christ’s sake. Notice this interpretation is based on the Aramaic Targum, a rabbinic translation of the MT. This rabbinic concept of suffering for the sake of God is spoken of throughout the Apostolic Writings. Romans 8:17 and if children, heirs also, heirs of God and fellow heirs with Christ, if indeed we suffer with Him so that we may also be glorified with Him. 2 Corinthians 11:23 Are they servants of Christ?–I speak as if insane–I more so; in far more labors, in far more imprisonments, beaten times without number, often in danger of death. James 5:10 As an example, brethren, of suffering and patience, take the prophets who spoke in the name of the Lord. 1 Peter 4:16 but if anyone suffers as a Christian, he is not to be ashamed, but is to glorify God in this name. This idea is the one who studies Torah and applies God’s way of life, truth, justice, and righteousness, will endure sufferings at the hand of the wicked for the glory of God and His Messiah Yeshua. Our patient endurance demonstrates the power of God and the indwelling of His Holy Spirit in our lives to enable us to remain faithful in the midst of troubles and sufferings. The unrighteous, the wicked, on the other hand who do not Study God’s Word, do not suffer as much, but when they do suffer, there is no glory, and nothing that is praise worthy for the Name of the Lord. The psalmist recognizes this, that on the one hand, he almost slipped into sin due to envy of the ways of the unrighteous and their lack of suffering, but on the other hand, the unrighteous man has nothing that is praise worthy, he does not have a refuge to lean upon, and he is unable to seek help from the Lord unless he were to repent and turn from his evil deeds, and seek the Lord God our father in heaven and His Messiah Yeshua. Asaph continues saying that the wicked adorn themselves with pride and violence (73:6). It is interesting how the Aramaic Targum translates it is their pride that has adorned them, they place a crown on their head because of their rapacity (n. greediness, covetousness, selfishness, quality of hunting other creatures for food). The Septuagint states that their pride clothes them with injustices and ungodliness. The idea is that pride causes them to be deceived to continue in their ways and perform more of these things. Because of pride they are self glorifying. On the other hand, we are called to be humble, and Yeshua states that we should allow others to glorify us rather than seeking the glory for ourselves. (see Luke 14:8-10) The MT states that their eyes bulge with fatness (73:7), and the Aramaic Targum states “their faces are distorted by fat,” and that “they will decay because of fatness.” (73:8) What is the significance of eyes that bulge with fatness? The MT text literally states, יָצָא מֵחֵלֶב עֵינֵמוֹ “to go out from fat of his eyes.” The Targum refers to facial expression, and that one will decay because of their fatness. The idea of fat draws with it that one is well fed or over eating. To decay from fat seems to be counter intuitive. Jeremiah 2:17 states, יז כִּי אֵין עֵינֶיךָ וְלִבְּךָ כִּי אִם-עַל-בִּצְעֶךָ וְעַל דַּם-הַנָּקִי לִשְׁפּוֹךְ וְעַל-הָעֹשֶׁק וְעַל-הַמְּרוּצָה לַעֲשֹוֹת: “But your eyes and your heart Are intent only upon your own dishonest gain, And on shedding innocent blood And on practicing oppression and extortion.” (NASB) The idea is that the eyes and the heart may be taken not as a reference to our organs, but for the restless looking about for sin. Jeremiah says they are intent upon dishonest gain, and doing so by the way of shedding innocent blood and oppression of the poor and helpless. The fat of the eyes appears to be a reference to the lusts of the flesh and the pride of life. The psalm continues saying, the unrighteous mock (73:8, ח יָמִיקוּ | וִידַבְּרוּ בְרָע עשֶׁק מִמָּרוֹם יְדַבֵּרוּ:), speak against the heavens (73:9, ט שַׁתּוּ בַשָּׁמַיִם פִּיהֶם וּלְשׁוֹנָם תִּהֲלַךְ בָּאָרֶץ:), and question how God knows and whether there is knowledge of the Most High (73:11, יא וְאָמְרוּ אֵיכָה יָדַע-אֵל וְיֵשׁ דֵּעָה בְעֶלְיוֹן:). Asaph speaks of the wicked who are at ease and increase in wealth (73:12, יב הִנֵּה-אֵלֶּה רְשָׁעִים וְשַׁלְוֵי עוֹלָם הִשְֹגּוּ-חָיִל:), and it is as if he has kept his heart pure in vane (73:13, יג אַךְ-רִיק זִכִּיתִי לְבָבִי וָאֶרְחַץ בְּנִקָּיוֹן כַּפָּי:) because of his hardship (73:14-15, יד וָאֱהִי נָגוּעַ כָּל-הַיּוֹם וְתוֹכַחְתִּי לַבְּקָרִים: טו אִם-אָמַרְתִּי אֲסַפְּרָה כְמוֹ הִנֵּה דוֹר בָּנֶיךָ בָגָדְתִּי:). Does it seem that walking in righteousness is in vane when troubles come? The Apostle Paul wrote in Galatians 2:21 “I do not nullify the grace of God, for if righteousness comes through the Law, then Christ died needlessly.” (NASB) The question of obeying God’s Torah is not about justifying ourselves before God, it is about doing what is right before the Lord. Obeying the Torah is not a vane action because the Lord is pleased with our striving to do what is righteous, holy, pure, in truth, and justice towards all men. But doing so to say “look I have earned a place in heaven because of my good deeds,” is not pleasing by the reason that if we have failed at one mitzvah, it is as if we have failed them all. If we violate one of the commands, we have failed to live up to the Torah. The real question then is whether we are prepared to do teshuvah? Do we care? Are we willing to look honestly at who we really are? Are we willing to try and do better next time? In truth teshuvah, in the full sense of the word, is really hard to do. It is easier to run away from our failings than to face them, let alone make to a change. On the other hand, realizing that failure is part of the human condition, the Lord God expects us to be obedient, but realizes that we do not have perfect obedience, failure is ok. The point is to perform Teshuvah, turn from sin and turn towards the Lord for His help and righteousness. The significance of Teshuvah is found in Midrash Rabbah Bereshit 22, Part 28 which states, “Such is the power of teshuvah? !” Adam exclaimed. “I did not realize that by doing teshuvah a person’s past misdeeds are erased so completely and considered by God as if they had never taken place!” In addition, when we perform Teshuvah we learn about ourselves, our Father in heaven, and Yeshua the Messiah when we walk in the ways of God according to the Torah. The point of Galatians 2:21 is with regard to what we have been seeing in the last few Psalms studies (68-72), that the Lord God places His righteousness upon us, God’s Messiah Yeshua brings with him the righteousness of God, and by faith in the Messiah, and in our Father in heaven, we receive the righteousness of God for justification (the forgiveness of sins) before the Lord. The Torah is an expectation of living as the people of God and is the manner in which we remain “in the Messiah” as Yeshua said “If you abide in me, and my words abide in you.” (John 15:7) This is the Word of the Living God, our Father in heaven! Asaph continues saying, טז וַאֲחַשְּׁבָה לָדַעַת זֹאת עָמָל היּא [הוּא] בְעֵינָי: יז עַד-אָבוֹא אֶל-מִקְדְּשֵׁי-אֵל אָבִינָה לְאַחֲרִיתָם: 73:16 When I pondered to understand this, It was troublesome in my sight 73:17 Until I came into the sanctuary of God; Then I perceived their end. (NASB) What is it about the sanctuary of God that caused Asaph to perceive the end of the wicked? Asaph came into the Sanctuary of God and he viewed the prosperity of the wicked in the light of his relationship with the Lord God in heaven. Those who appeared to be doing well are in fact in great peril. Asaph realized that it is due to the mercy of God and His Righteousness that he is able to stand in His presence in the Sanctuary. The unrighteous will not get away with their sins; there will be a day of reckoning. He sees his relationship with the Lord in light of our Father in heaven being the true refuge, help, redemption, salvation, and hope. In the Sanctuary he is able to focus upon the Lord and His attributes, His mercy and kindness to His people. In comparison, he says the Lord has placed the wicked in slippery places, (73:18, יח אַךְ בַּחֲלָקוֹת תָּשִׁית לָמוֹ הִפַּלְתָּם לְמַשּׁוּאוֹת:), and the Lord will cause them to be swept away (73:19, יט אֵיךְ הָיוּ לְשַׁמָּה כְרָגַע סָפוּ תַמּוּ מִן-בַּלָּהוֹת:), and they will be like a dream that will pass away (73:20, כ כַּחֲלוֹם מֵהָקִיץ אֲדֹנָי בָּעִיר | צַלְמָם תִּבְזֶה:). The reason is that the wicked have hardened their hearts toward the Lord God in heaven. They have become proud, arrogant, and supposedly independent of Him. As a result of their prosperity, Asaph says that he was pierced within (73:21, כא כִּי-יִתְחַמֵּץ לְבָבִי וְכִלְיוֹתַי אֶשְׁתּוֹנָן:), and like an animal before God (73:22, כב וַאֲנִי-בַעַר וְלֹא אֵדָע בְּהֵמוֹת הָיִיתִי עִמָּךְ:). But what is interesting about the way in which Asaph writes, the animal that is before the Lord, sounds as if he is describing himself as an animal that is prepared for slaughter. This has the concept of the one who draws near or close to the Lord at the altar and the Tabernacle and then lays down his life. Through his suffering and agony, he drew closer to the Lord, as opposed to the wicked, the prosperity of the wicked caused them to draw further away from the Lord. As a result, Asaph’s trails and by similar reasoning, our trials may be understood as a gift from the Lord for our own good. Our struggles cause us to seek the Lord for help which lead us into a deeper intimacy with the Lord and with the Messiah Yeshua. Because of these things Paul and the rabbis are able to speak of being counted worthy to endure sufferings for the glory of God, and as Paul said, for Christ’s sake (see previous Scripture references). Trusting in the Lord and striving to live a righteous and holy life are not a means for earning eternal life, but for blessings in both this life and in the world to come (gifts and rewards). (see James 1:12, Luke 12:33-34,1 Timothy 6:17-19,Matthew 5:12, 5:17-19, 6:4-6, 6:18-21, 25:21, 25:14-30, 25:46, Revelation 2:11-12, 21:4, 20:12-13, 21:8 , 22:12,Revelation 2:10, 2 Corinthians 5:10, 1 Corinthians 2:9, 3:8, 3:12-15, 2 Timothy 2:11-12, 4:7-8, Romans 11:19-22, John 14:2, Jeremiah 17:10, Isaiah 40:10, Tehillim / Psalm 18:20, Luke 18:22, Malachi 3:10, Hebrews 11:16) As a result, Asaph said he continued to serve the Lord, (73:23, כג וַאֲנִי תָמִיד עִמָּךְ אָחַזְתָּ בְּיַד-יְמִינִי:) because the Lord is good. Asaph continues saying, כד בַּעֲצָתְךָ תַנְחֵנִי וְאַחַר כָּבוֹד תִּקָּחֵנִי: 73:24 With Your counsel You will guide me, And afterward receive me to glory. (NASB) Asaph speaks of being taken to glory. Is this a belief that when one dies, they are taken to heaven? When we think of being taken up to heaven, we are reminded of two stories in the Scriptures, (i) Enoch (Bereshit / Genesis 5:21-24), and (ii) Elijah (2 Kings 2:1-12). These stories are very memorable and amazing, that the Lord God would take a man from this world into the next. Not to compare the righteous deeds of these men to the deeds of Yeshua, but this is a similar thing that happened to Yeshua, ascending into heaven on a cloud, the Lord God took him into glory. Note, the Lord taking Yeshua into glory is a very important concept. The rabbis reason that no man can go to heaven and see God. However, their commentaries have a lot to say on this matter. The Talmud and a few commentaries speak about what happened to both Enoch and Elijah. We do not find that any person had enjoyed G’d’s “light” from the time of Adam until the appearance of Chanoch whom G’d took from this earth and made into an angel (Genesis 5:24), the one usually referred to as Mattatron. Tossaphot query how this Mattatron could be described as שר הבריאה, in charge of the universe, seeing that חנוך did not live till long after the universe was created, and they therefore solve the problem in a different way. [This problem is discussed in Tossaphot Yevamot 16 and relates to part of the liturgical poetry in the morning prayer of שמחת תורה. Ed.] I do not think that there is really any substance in the query posed by Tossaphot for all those who have been granted some insight. The שר הבריאה certainly existed ever since the בריאה itself, and he is called Mattatron, since it is his function to guard over everything that reflects G’d’s expressed will. The word מטרה is the translation of the Hebrew word שומר, guardian. חנוך performed a similar function on earth until G’d decided to remove him from earth while alive (Genesis 5:24). While on earth, he performed what the Kabbalists call the בחינה התחתונה, the “minor” function of Mattatron on earth. This “minor” function is known as מנעל, shoe. The force in charge of such activities is called Sandalphon, from the Hebrew סנדל, a sandal. Solomon sings the praises of such people when he says in Song of Songs 7:2מה יפו פעמיך בנעלים, “How lovely are your footsteps when shod in pilgrim’s sandals.” This is the hidden meaning of the Midrash Talpiot which describes Chanoch as a shoemaker. I have explained this elsewhere at length. The commentary on the Torah portion for both Noach and Chayei Sara titled “the sending of Torah light” (Shelah Torah Ohr) has a very kabbalistic approach to the interpretation of Enoch passages from the Torah on Enoch being taken up from this earth. Shlach, Noach, Torah Ohr states that Enoch was taken from this earth and transformed into a angel. This suggests a belief that Enoch was in fact translated to heaven from earth, and in order for him to stand in God’s presence, the Lord transformed him into a angel. The commentary Shelah, Chayei Sara, Torah Ohr states that Enoch is referred to as the Mettatron. Mettatron (מטטרון) is known as an archangel in Judaism as the Chancellor of Heaven. According to Jewish medieval apocrypha, Enoch the ancestor of Noah was transformed into an angel in heaven. However, there are no actual references to this happening (a man being transformed into an angel) in the Tanach or in the Apostolic Writings. Bereshit / Genesis 5:24 however is often cited as evidence of Enoch’s bodily ascension into heaven. The Babylonian Talmud mentions Mettatron in two places, (i) Sanhedrin 38b and (ii) Avodah Zarah 3b. In Sanhedrin 38b a Minim tells Rabbi Idith that Mettatron should be worshiped because he has a name like his master. Rabbi Idith uses the passage Shemot / Exodus 23:21 to show that Mettatron was an angel and not a deity and thus should not be worshiped. Furthermore as an angel Mettatron has no power to pardon transgressions nor was he to be received even as a messenger of forgiveness. The important aspect of the Talmudic commentary is that the Mettatron did not function as the King Mashiach as we have been studying previously, the one who comes with the righteousness, mercy, forgiveness, and judgment of God. There are significant differences between the Mettatron and the Messiah figure described in the Tanach and the Apostolic Writings. According to Avodah Zarah 3b, the schools are divided into quarters, and in the fourth quarter the Lord God sits and instructs the school children. According to the rabbis, in the preceding three quarters Metatron may take God’s place or the Lord God may do this too. In the Talmud Bavli Yevamot 16b, we find a record an utterance attributed to the Prince of the World which states, “I have been young and now I am old,” where rabbinic tradition attributes this utterance to Mettatron. Shelah, Chayei Sara, Torah Ohr describes the Mettatron as preexisting the creation or at least having existed from since the beginning (בריאה). The Mettatron’s function is to guard over all things that express God’s will saying, “The word מטרה is the translation of the Hebrew word שומר, guardian.” The rabbis draw a parallel to Enoch performing a similar function on earth, and so he was taken from the earth while alive to perform the minor functions of the Mettatron. This suggests that there may be more than one Mettatron, or that one may share in this role of Mettatron. This might also provide us with some insights into the word Mashiach in the sense that there are many Mashiach (anointed ones) of God, but there is only one Mashiach, Yeshua the King Messiah. Nevertheless, the Mettatron appears to function in a different manner than the King Mashiach is described and therefore it would not be a logical conclusion to state that the Mettatron is a type, shadow, or figure of the King Mashiach. The rabbis also have the following to say about Elijah being taken up into heaven from the Talmud, Shelach Torah Ohr, and Ein Yaakov. and it has been taught, R. Yose stated: The Shechinah never descended to earth, nor did Moses or Elijah ever ascend to Heaven, as it is said, ‘The heavens are the heavens of the Lord, but the earth He has given to humanity” (Psalm 119:16). But did the Shechinah not descend to earth? Isn’t it written, “And the Lord came down upon Mount Sinai?” (Exodus 19:20)? That was above ten handbreadths [from the summit]. But is it not written, “And His feet shall stand in that day upon the Mount of Olives?” (Zechariah 14:4)? Above ten handbreadths. But did not Moses and Elijah ascend to Heaven? Is it not in fact written, “And Moses went up unto God?” (Exodus 19:3). [That was] to a level lower than ten [handbreadths from heaven]. But is it not written, “And Elijah went up by a whirlwind into heaven?”(II Kings 2:11) [That was] to a level lower than ten handbreadths But is it not written, “He seizes hold of the face of His throne, and He spreads His cloud upon him,” (Job 26:9) and R. Tanhum said: This teaches that the Almighty spread some of the radiance of his Shechinah and his cloud upon him? That was at a level lower than ten handbreadths. But in any case is it not written, “He seizes hold of the face of His throne”? The throne was well lowered for his sake until [it reached a level] lower than ten handbreadths [from Heaven] and then he seized hold of it. Midrash Shemuel on Avot quotes the opinion of Rabbi Shimon ben Tzadok to the effect that the Rabbi Shimon who told us about the advantages of silence in the above quoted Mishnah was one of the Ten Martyrs. All these martyrs sanctified not only their souls but also their bodies. There are two methods of sanctifying the body. 1) The way of Rabbi Akiva and his colleagues who died on קדוש השם, a martyr’s death.This kind of holiness is referred to in the Torah as: והייתם קדושים (11,45). The second method of achieving holiness of the body is referred to in the Torah as: אני ה’ מקדשם (21,23). Nadav and Avihu acquired holiness of the body via the second method, i.e. their souls were burned whereas their bodies remained intact. Their departure from this world was similar to that of Chanoch (Genesis5,24), and Elijah (Kings II 2:11). This is why I believe that the reason their bodies remained intact was that their death was due to the intimacy they had established with G’d. When Rabbi Shimon said that he had not found anything better for the body than silence, he alluded to the instruction given to Rabbi Akiva and the other Martyrs to be silent and accept G’d’s decree without question. SUCCAH (Fol. 5) We have been taught in a Baraitha: R. Jose says: “Never did the Shechina come down below [on earth], and Moses and Elijah never ascended to heaven; for it is written (Ps. 115:16) The heavens are the heavens of the Lord, but the earth hath He given to the children of man.” Then, the Shechina, you contend, never came down below? Behold, it is written (Ex. 19:20) And the Lord came down upon Mount Sinai. This was ten spans above the ground. But it is written (Zech. 14:4) And his feet will stand on that day upon the mount of Zeithim (Olives). This was ten spans above the ground. Again, [let me ask], is it indeed a fact that neither Moses nor Elijah ever ascended to heaven? Behold, it is written (Ex. 19:3) And Moses went up unto God? This means below ten spans. But it is written (II Kings 2:11) And Elijah went up by a storm wind into heaven. This also means below ten spans. But it is written (Job 26:9) He lays hold of the face of His throne and spreads His cloud over him; and R. Tanchtum said: “This means to teach us that the Almighty spread the brightness of the Shechina and enveloped Moses with encouragement.” This also refers to below these ten spans. However, it is written, he (Moses) lays hold of the face of His throne [hence they were both together]. He brought down His throne close to ten spans, where Moses took hold of it. In 2 Kings 2:11, the Scriptures speak of Elijah being taken into heaven. According to the Talmud, Shelah Shmini Torah Ohr, and Ein Yaakov, the conclusion is that the Lord lowered His throne for Elijah’s sake so that he could take hold of the throne. Again the idea is that no man can stand before God and live, no man can see his face based upon Parashat Ki Tisa (Shemot / Exodus 34). The conclusion of the rabbis is that Elijah was in fact caught up to heaven and he touched the throne of God. As we have been studying in Midrash Tehillim 68-71, the rabbis have concluded that where one’s merit falls short, the Lord places His Righteousness upon us for Salvation’s sake for the purpose of His dwelling in our midst. This is a significant aspect of the Lord God our father in heaven and of the King Mashiach who brings with him God’s Righteousness to be given to the people. The rabbinic conclusions for the Lord dwelling in the midst of the congregation of Israel in the wilderness (pillar of could and fire) yet while the people were so sinful in their thoughts and deeds, had led to the interpretation that the Lord had placed His Righteousness upon the people for their salvation from death. In a similar manner, today in His Messiah Yeshua, we receive God’s Righteousness, for salvations sake, in both the Olam HaZeh and the Olam Haba. Asaph speaks of being taken to glory according to the Psalm and this belief is consistent with both the rabbinic interpretation and the interpretations of what we find in the Apostolic Writings by Yeshua, Paul and the disciples. Asaph concludes his psalm saying, כה מִי-לִי בַשָּׁמָיִם וְעִמְּךָ לֹא-חָפַצְתִּי בָאָרֶץ: כו כָּלָה שְׁאֵרִי וּלְבָבִי צוּר-לְבָבִי וְחֶלְקִי אֱלֹהִים לְעוֹלָם: כז כִּי-הִנֵּה רְחֵקֶיךָ יֹאבֵדוּ הִצְמַתָּה כָּל-זוֹנֶה מִמֶּךָּ: כח וַאֲנִי | קִרֲבַת אֱלֹהִים לִי-טוֹב שַׁתִּי | בַּאדֹנָי יְהוִֹה מַחְסִי לְסַפֵּר כָּל-מַלְאֲכוֹתֶיךָ: 73:25 Whom have I in heaven but You? And besides You, I desire nothing on earth. 73:26 My flesh and my heart may fail, But God is the strength of my heart and my portion forever. 73:27 For, behold, those who are far from You will perish; You have destroyed all those who are unfaithful to You. 73:28 But as for me, the nearness of God is my good; I have made the Lord God my refuge, That I may tell of all Your works. (NASB) Asaph describes the absolute refuge that we find in the Lord God in heaven. Though flesh and blood may fail, no matter what troubles we may be going through, the Lord is faithful to us. Those who do not know the Lord, perish without hope. The one who has made the Lord his refuge will be able to speak of the glory and work of the Lord God in heaven! Let’s Pray! 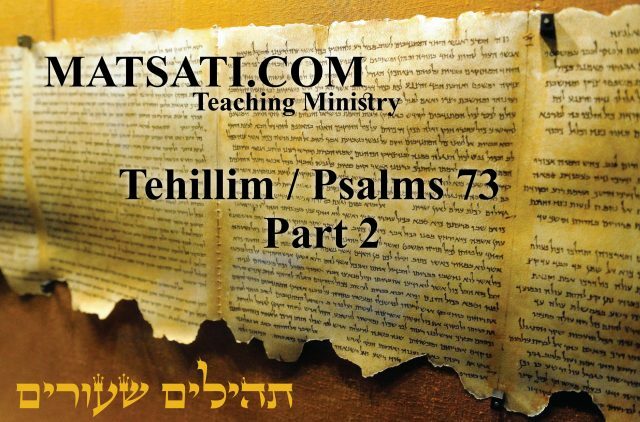 The Rabbinic Commentary (Midrash) on Tehillim / Psalms 73 has 4 parts. Reading through the Midrash we will be looking at Part 1, 2, 3, and 4. Let’s begin by outlining Midrash Tehillim Chapter 73, Parts 1, 2, 3, and 4. The משל (mashal) “the parable,” goes on to explain the פתיחתא (Petihta), the rabbis comment upon Asaph’s words of being envious of the wicked. The נמשל (Nimshal) “expansion on the parable” expands upon the משל (mashal), the rabbis expand upon the mashal saying that the Holy One blessed be He brought hardships upon Israel for her own good, for the purpose of reproof to draw them back to Him in repentance. The משל (mashal) “the parable,” goes on to explain the פתיחתא (Petihta), the rabbis comment upon Asaph’s words and suggest that the Lord makes a righteous man’s ways prosper, whereas, the wicked, their ways always prosper. The נמשל (Nimshal) “expansion on the parable” expands upon the משל (mashal), the rabbis expand upon the mashal with examples of pride, the wicked, giants, and demons. The משל (mashal) “the parable,” goes on to explain the פתיחתא (Petihta), the rabbis comment upon Asaph’s words to describe the eyes of the wicked that have become fat and protrude by reason of their pride and greed. The נמשל (Nimshal) “expansion on the parable” expands upon the משל (mashal), the rabbis expand upon the mashal saying the wicked have been given more than they desired. The משל (mashal) “the parable,” goes on to explain the פתיחתא (Petihta), the rabbis comment upon Asaph’s words to describe the the mouth that is set against the heavens. The נמשל (Nimshal) “expansion on the parable” expands upon the משל (mashal), the rabbis expand upon the mashal using parables of the fig tree that speaks in the world to come. The midrash speaks of the wicked and their lamp burning brightly, whereupon in the World to Come (Olam Haba) their lamp will be put out by God. In Matthew 6:22 Yeshua said, “The eye is the lamp of the body; so then if your eye is clear, your whole body will be full of light.” (NASB) suggesting that the eyes have a way to cause the body to have “light.” (see also Luke 11:34) The meaning of “the light of his body” coupled with the rabbinic illustrations and comparisons between light and darkness, truth and lies, righteousness and unrighteousness, these things draw for us the illustration that this light, if it is a light that leads to wickedness, unrighteousness, and evil, this light can not be sustained in the World to Come because the Lord God is righteous and holy. The Lord who is righteous will put it out. The important point is that we must consider our lives and the words of the Apostolic Writings that we are sincere in our return to the Lord and that we act upon our faith on a daily basis. In doing this the Lord will work in our lives to take care of impurity, uncleanness, and sin. How much responsibility do we have on our part to strive for righteousness, to walk in God’s ways, and to seek the Lord for help with everything? How much of an impact will this have on the way we stand before the Lord for inspection? (see Matthew 7) Based upon the Matthew 7 narrative, the question that arises is “are you only doing things in the Name of Jesus, or are you actually doing the will of the Father in heaven?” Our attitude is as important an aspect of our salvation as is our faith in Yeshua because both are intimately connected. In addition, we are told according to the Greek Manuscript the following in Matthew 7:23 which states, 23καὶ τότε ὁμολογήσω αὐτοῖς ὅτι Οὐδέποτε ἔγνων ὑμᾶς: ἀποχωρεῖτε ἀπ’ ἐμοῦ οἱ ἐργαζόμενοι τὴν ἀνομίαν. “And then I will declare to them, ‘I never knew you; DEPART FROM ME, YOU WHO PRACTICE LAWLESSNESS.’(NASB) It is important to note the use of the words that Yeshua uses, he says ἀνομίαν which means “the condition of without law or having contempt coupled with the violation of law.” The will of the Father is to obey His Word, and to have the correct motivation for doing so, because we love him, not for the purpose of building up righteousness to gain entrance into heaven. We are to love His ways because He is holy, righteous, and true. We are to love His ways because He has made us holy and righteous, and we were created for this specific purpose. This is the meaning of living by our faith. Granted, we all make mistakes, we all fail, and we all sin. But the general attitude today is that one does not need to be grieved over one’s sins because we have Yeshua (hypergrace movement). The point is, though we sin, we are striving to turn from our sins, and to walk in the light as John wrote in 1 John 1. Notice what the midrash says as the rabbis continue to discuss this point of the wicked having their light put out in the World to Come. They say that the fear of the Lord will lead to eternal life that will not be cut off. Asaph was envious of the arrogant because he saw their prosperity. He finally realized that the Lord brought afflictions upon His people in order to do good to them. The rabbis even say that afflictions from the Lord are a good thing. How are afflictions a good thing? Does the Lord do this to us today? The example that is given is of a woman weaving a thread, saying that for the wicked, there are no uneven threads, whereas when a woman is spinning thread and it is broken, it must be knotted, however for the wicked, there are no broken spots, there are no blemishes, and there are no threads that are pressed thin through the weaving process. This is paralleled to the body that is sound as an edifice or a building. On the other hand, the righteous suffer all of these things, having pains, illness, hardships, and troubles. What is the point of the Lord bringing these things upon the righteous, as opposed to the unrighteous who seem to go about without trouble? The Rabbis say that the Lord does not hinder the desires of the wicked, and give a parable of a physician and a sick man, the physician gave the sick man whatever he desired to eat, because in any event, he was going to die of his illness. The reason good things happen to the unrighteous, is by reason of their not repenting of their sins, they will continue in their evil ways and not forsake them or seek the Lord God in heaven, or acknowledge that the Lord in heaven is the One who has blessed them with what they have. On the other hand, the righteous receive all sorts of troubles. Though the righteous suffer, he or she remains faithful to the Lord, to do good to others, and continue to glorify the name of the Lord. This becomes a testimony to the Lord God in heaven, for His glory and not for our own. It seems the point of suffering is to keep us humble, to remain faithful, and to seek the Lord our Father in heaven and the His Messiah Yeshua for help. Midrash Tehillim 73, Part 1 concludes saying, “So Moshe our teacher said of the wicked, The faithful God repays them that hate Him to their face, to destroy them (Devarim / Deuteronomy 7:10). Hence, Verily their desires are not hindered even unto their death; they are sound, and afflictions do not touch them.” The idea is that the good things the Lord gives to the wicked are for their undoing and destruction. The wicked will never turn from their evil ways when receiving good, even more so when receiving bad things. So the Lord is righteous before all men, as Job says to his wife, Job 2:10 “… Shall we indeed accept good from God and not accept adversity?” In all this Job did not sin with his lips.” (NASB) When bad things happen, do not blame the Lord God in heaven, but seek Him, and Yeshua the Messiah, as a testimony for His glory. ב בעמל אנוש אינימו [ועם אדם לא ינגעו]. וכן איוב הוא אומר בתיהם שלום מפחד ולא שבט אלוה עליהם (איוב כא ט), אין אחד מהם חושש לא בעינו ולא בשינו, ולא עוד אלא שהקב״ה מייחל לפניהם את הדרכים, שנאמר יחילו דרכיו בכל עת (תהלים י ה), ולא עוד אלא שאין הייסורין נוגעין בהם, שנאמר מרום משפטיך מנגדו (שם שם תהלים י׳), ולא עוד אלא שרודין בשונאיהן, שנאמר כל צורריו יפיח בה (שם שם תהלים י׳), הוי בעמל אנוש אינימו. לכן ענקתמו גאוה. ובשביל שאינן מתייסרין, הרי הם מתגברין כענקים ומולידין כשידים, שנאמר לכן ענקתמו גאוה יעטף שית חמס למו, ואין יעטוף אלא לשון לידה, שנאמר ובהעטיף הצאן [וגו׳] והי׳ העטופים ללבן (בראשית ל מב), ואין שית אלא מזיקים ובעלי חמס, כמה דאת אמר שמיר ושית (ישעיה ה ו). 2. They are not in trouble as other men; neither are they plagued like other men (Tehillim / Psalms 73:5). As Job said, Their houses are safe, without fear, neither is the rod of God upon them (Job 21:9). That is, not a man among the wicked feels any pain, not even in an ear, not even in a tooth. No, more, The Holy One blessed be He makes their ways prosperous before them, as is said, The wicked, his ways prosper at all times (Tehillim / Psalms 10:5). No, even more, Punishments do not fall upon the wicked, as the verse goes on to say, Your judgments are far above out of his sight. No still more, The triumph over their adversaries, for the verse concludes, As for all his adversaries, he puffs at them. Hence, They are not in trouble as other men (Tehillim / Psalms 73:5). Therefore, pride makes them like the giants (Tehillim / Psalms 73:6). Because the wicked never suffer punishments, they lord it like giants over the people, and they propagate like demons, as is said, Therefore pride makes them like the giants whose mothers were covered (ya’atof) by demons (sit) and by them were begotten for violence (Tehillim / Psalms 73:6). Here the word ya’atof (covered) clearly refers to the act of propagation as in the verse, But when the cattle had been covered, he put them not in (Bereshit / Genesis 30:42), and the word “sit” (demons) clearly refers to thorns and demons of thistles (sit) (Isaiah 5:6). The midrash states that the wicked feel no pain, not even in the ear or in a tooth. Their prosperous ways are attributed to the Lord. Does the Lord prosper the wicked as the rabbis are saying here? Why do the rabbis say the Lord prospers the wicked? The rabbis in the rabbinic literature have found a problem in the idea of a merciful and loving God according to the Torah allowing the existence of evil in this world. The issue is of the existence of evil it self. The rabbis insist that as the origin of “good” (טוב) comes from God so, ultimately, does evil (רע). This belief was intended to discount any implications of duality, under the idea of a separate deity from whom evil springs. By this reasoning, the rabbis say, “Man should bless God for the evil which occurs in the same way that he blesses Him for the good” (Talmud Bavli Berekhot 33b). The concept here from the mind of the rabbis is that there are not two gods, one who is good, and the other who is evil, which is prevalent in the other major religions throughout history, Egypt, Rome, Greece, Babylon, etc. This anti-dualistic motif is found in Isaiah 45:6-7 which states, “I am the Lord, there is none else; I form the light, and create darkness; I make peace, and create evil.” Note, in the Sidur this is changed to “makes peace and creates all that exists,” implying that evil itself is more of a passive phenomenon in the sense that it is the absence of good. Another issue is on the distribution of good and evil to the righteous and the wicked, respectively. In the one sense, according to the Scriptures, this is not well understood because man is not capable of understanding, as it says in Shemot / Exodus 33:19, “I will be gracious to whom I will be gracious, and will show mercy on whom I will show mercy” which is also quoted in the Talmud Bavli Berekhot 7a. An alternate interpretation on the distribution of good and evil, is that the righteous man who suffers in this world is not wholly righteous, and the wicked man who prospers is not wholly wicked; or alternately the former is perhaps not a descendant of righteous ancestors, while the latter prospers because of the merit of his fathers (Talmud Bavli Berekhot 7a). In addition, the rabbis also attribute evil to Satan or to various malicious demons who are at the root of the trouble caused to the righteous (see the Talmud Bavli Berekhot 6a and Midrash Rabba Bereshit 84, Part 3). This also seems to be the Christian approach to understanding evil in this world as well (see Paul in Ephesians 6). Another interpretation on evil is concerning evil that is caused by man himself, meaning that evil is the result of and not identical to the Yetser Ha’ra (the evil inclination, Talmud Bavli Ḥag. 16a). The rabbis believed that the evil inclination is a necessary part of our existence in this world. The reason being, without the evil inclination, one would not covet to build a house, marry, raise a family, or engage in trade (see Midrash Rabbah Bereshit 9, Part 9). It is for this reason that man is also given the Yetser Ha’ra and the Torah, which was meant to take control of man’s evil inclination so it does not run out of control (see Talmud Bavli Kidushim 30b). The Lord then works in one’s life to gain control of his desires so that he is able to serve God with both the Yetser ha’tov and the Yetser Ha’ra (Mishnah Berekhot 9:5). The Lord God helps one to continue in his worldly pursuits while at the same time to grow in holiness. Nonetheless, the rabbis continually reaffirm the ultimate goodness of God and of His creation as they say in Midrash Tehillim 73, Part 1, “But having realized it, Asaph began saying God is good, but God is good to Israel, that is, the afflictions which He brings upon them are good things.” The advise of the rabbis is to continually state, “All that the Merciful One does is for the good” (Talmud Bavli Berekhot 60b), where they reassure us saying God’s reward exceeds that of His punishment (Talmud Bavli Yoma 76a). So, consistent with the rabbinic understanding of good and evil, Midrash Tehillim 73, Part 2 states, “No, even more, Punishments do not fall upon the wicked, as the verse goes on to say, Your judgments are far above out of his sight. No still more, The triumph over their adversaries, for the verse concludes, As for all his adversaries, he puffs at them. Hence, They are not in trouble as other men (Tehillim / Psalms 73:5).” The wicked are receiving their reward in this world, but what they have to look forward to in the World to Come is everlasting suffering. Because of their prosperity, their pride increases, and because they do not suffer as the righteous do, they become lords over the people, they increase their wealth and lay a heavy hand upon God’s people because of their unrighteousness. Their pride is said to make the wicked like giants whose mothers were covered by demons, upon whom they had begotten them for the purpose of violence. This sounds like a reference to Bereshit / Genesis 6 and the Scripture that says “the sons of God took the daughters of men…” etc. Midrash Tehillim 73, Part 2 concludes saying, “Here the word ya’atof (covered) clearly refers to the act of propagation as in the verse, But when the cattle had been covered, he put them not in (Bereshit / Genesis 30:42), and the word “sit” (demons) clearly refers to thorns and demons of thistles (sit) (Isaiah 5:6).” The idea is that these evil men were birthed for violence, the demons refer to thorns and thistles. This brings some rabbinic context to Hebrews 6:8 which speaks of the unrighteous, the land, and thorns and thistles. Note how the author of Hebrews speaks of having tasted the grace of God and then turning from the Lord and falling away. The result of which is to crucify the Son of God over and over again, and subject him to disgrace. He says 6:8 But land that produces thorns and thistles is worthless and is in danger of being cursed. In the end it will be burned. (NIV) Note how the thorns and thistles are said to be in danger of being cursed. The thorns and thistles are paralleled to sin, and demons by the rabbis. The concepts here may be that the author is saying, having tasted of the grace of God, how can you turn from Yeshua and from our Father in heaven? In a similar and parallel fashion, the demons, having once tasted the glory of God, turned from Him and His presence and rejected Him. This is exactly what will happen to the wicked, to the one who turns from the Lord, despises his Torah, and does not produce good fruit, he will be like the thorns and thistles, he will be cursed, cast into the fire to be burned. All of these concepts are very consistent with the rabbinic thought on the reasons why the righteous appear to suffer, whereas the wicked appear to prosper. ג יצא מחלב עינימו. נשתנה דמותם מרוב שמנונית שבהם, ועיניהם בולטות מפני שמנונית שבהם, וכן אתה למד שמן העניות ומן הרעב עיניהם של אדם מעמיקות, וכן בני קרח אמרו עיני דאבה מני (בכי) [עוני] (תהלים פח י), וכן דוד אמר עששה מכעס עיני (שם תהלים ו ח). עברו משכיות לבב. מהו משכיות, הרבה נתת להם יותר ממה שהם מבקשין, יש שהיה משכים להיות בעל זמורה, עשית אותו שלטון, יש שהיה משכים להיות שלטון, עשית אותו שר הצבא, העברת עליהם על כל מה שהיו משכימין, הוי משכיות לבב, ובשביל כן ימיקו וידברו (עתק) [ברע עושק]. 3. Their eyes stand forth from fatness (Tehillim / Psalms 73:7). Their aspect is changed by the abundance of fat on them; because of the fat on them, their eyes protrude. Contrariwise, you learn that the eyes sink back in a man’s head from poverty and from hunger. Thus, the sons of Korach said, My eye languishes by reason of affliction (Tehillim / Psalms 88:10). And David said, My eye is dimmed because of vexation (Tehillim / Psalms 6:8). They have gone beyond the desires of the heart (Tehillim / Psalms 73:7). What is meant by the words, beyond the desires of the heart? They mean, To wicked men You have given even more than they desired. Thus, if there was a man who desired to become a lector, You made him into a magistrate. If there was a man who desired to become a magistrate, You made him into a general. You surpass for them all that they desired. Hence, They have gone beyond the desires of the heart. And so the next verse says, They are corrupt and speak wickedly concerning oppression; they speak loftily (Tehillim / Psalms 73:8). The rabbis make a contrast between those who are fat by reason of abundance, as opposed to those who are poor and hungry, with regard to one’s eyes. As we had learned previously, the fatness of the eyes is a reference to wickedness, to lust, covetousness, and sin. Specifically, the one whose eyes stand forth from fatness is similar to the one who is prideful, arrogant, and desires to take from the poor and helpless to add to his own abundance. On the other hand, the poor and hungry do not seek the harm of others, they seek the help of God to get their food, and seek to do good to one another. The remainder of the midrash speaks of the poor, the rabbis say, “Thus, the sons of Korach said, My eye languishes by reason of affliction (Tehillim / Psalms 88:10). And David said, My eye is dimmed because of vexation (Tehillim / Psalms 6:8). They have gone beyond the desires of the heart (Tehillim / Psalms 73:7).” The idea is that poverty has the power to cause one’s heart to desire different things as opposed to the one who is prosperous and wealthy. In order to understand the desires of the heart, the midrash speaks of a parable saying, “What is meant by the words, beyond the desires of the heart? They mean, To wicked men You have given even more than they desired. Thus, if there was a man who desired to become a lector, You made him into a magistrate. If there was a man who desired to become a magistrate, You made him into a general. You surpass for them all that they desired.” The parable speaks of the Lord God giving a person more than he desires. This sounds similar to what the Apostle Paul wrote in his epistle (Ephesians 3:14-21). Here Paul tells the Ephesians that the love of the Messiah surpasses knowledge (γνῶναί τε τὴν ὑπερβάλλουσαν τῆς γνώσεως ἀγάπην τοῦ Χριστοῦ, ἵνα πληρωθῆτε εἰς πᾶν τὸ πλήρωμα τοῦ θεοῦ.) The Greek text states ὑπερβάλλουσαν τῆς γνώσεως “surpassing understanding.” Similar to what is written in the midrash, the Lord works in our lives because He loves us, and He gives us much more than we ask. According to David, the key to receiving the desires of our heart from the Lord is to “Take delight in the Lord.” When we take delight in the Lord, we will begin to desire the same things He desires, such as, Justice, Mercy, Forgiveness, Obedience, Love, Wisdom, Peace, and Kindness towards one another. David tells us to “cultivate faithfulness” (37:3). How do we cultivate faithfulness on our lives? One of the primary ways to begin cultivating faithfulness is to believe in the Messiah Yeshua, and obey the commands. Faith and obedience are intimately connected. Notice how David says that when we cultivate faithfulness, we delight in the Lord, and we commit our ways to Him and trust in Him, He will bring forth our righteousness as a light. Note how righteousness is connected to the commandment. The mitzvah (commandment) is to love God and to love our neighbor (two mitzvot among many others), which is the reason David says, 37:8 Cease from anger and forsake wrath; Do not fret; it leads only to evildoing. (NASB) and 37:7 Rest in the Lord and wait patiently for Him; Do not fret because of him who prospers in his way, Because of the man who carries out wicked schemes. (NASB) These things appear to follow what is being said in the midrash. The unrighteous man does not delight in God’s ways, and by reason of his lust for sin his eyes are fat and bulge, stand forth because of the abundance of wickedness. ד שתו בשמים פיהם. פרעה אמר מי ה׳ אשר אשמע בקולו (שמות ה ב), נבוכדנאצר אמר (מאן הוא אלהא) [ומן הוא אלה] די ישיזבינכון מן ידי (דניאל ג טו), אבל אני ואהי נגוע כל היום ותוכחתי לבקרים. אמר ר׳ שמואל בר נחמני לפי שבעולם הזה הזכר מסבב את הנקבה, אבל לעתיד הנקבה תסבב את הזכר, שנאמר נקבה תסובב גבר (ירמיה לא כא), לפי שבעולם הזה הקב״ה מחזיר על ישראל שיעשו תשובה ויעשו רצונו, אבל לעתיד ישראל מחזירין אחר הקב״ה שיעשו רצונו, שנאמר ואת רוחי אתן בקרבכם (יחזקאל לו כז), אמר ר׳ שמעון בשם ר׳ סימון חסידא בעולם הזה אדם הולך ללקוט תאנים, אין התאנה אומרת כלום, אבל לעתיד אדם הולך ללקוט תאנה בשבת, והיא צווחת ואומרת שבת היא, בעולם הזה אדם הולך ומשמש מטתו נדה, אין מטתו מעכבתו, אבל לעתיד אדם רוצה לילך ואשתו נדה, האבן צועק ואומר נדה היא, לכך עד מתי תתחמקין הבת השובבה (ירמיה לא כא), שהיא עתידה להיות מלהטת לפני הקב״ה שהן עושין תשובה, והקב״ה עושה להן רצונם, ולא עוד אלא אף השמים מטיפין להם עסיס, שנאמר והיה ביום ההוא יטפו ההרים עסיס (יואל ד יח), ואין יטיף אלא לשון נבואה, שנאמר והטף אל דרום (יחזקאל כא ב). 4. They set their mouth against the heavens (Tehillim / Psalms 73:9). Pharaoh said, Who is the Lord, that I should obey His voice to let Israel go? (Shemot / Exodus 3:15). But as for me, All the day long have I been plagued, and chastened every morning (Tehillim / Psalms 73:14). Therefore He returns His people; and waters of fullness are drained out by them (Tehillim / Psalms 73:10). Rabbi Samuel son of Nahmani taught, As in this world the man courts the woman, and as in the time to come, the woman will court the man, for it is said, A woman shall surround a man (Jeremiah 31:22), so in this world, the holy One blessed be He, courts the children of Israel in order to make them repent and do His will, but in the time to come, the children of Israel will court the Holy One blessed be He, to be allowed to do His will of their own accord, as is said, I will put My spirit within you, and cause you to walk in My statutes, and you will keep My ordinances, and do them (Ezekiel 36:27). Rabbi Simeon said in the name of rabbi Simeon the Pious, In this world if a man goes about gathering figs on a Shabbat, the fig tree says nothing at all; but in the time to come, if a man should go to glean a fig tree on a Shabbat, the tree will call aloud to him and say, It is the Shabbat! In this world, if a man goes to do the service of his bed while his wife is menstruating, his bed will not hinder him; but in the time to come, if a man desire to go to his wife while she is menstruating, the very stone in the wall will cry out and say, She is Menstruating! Therefore, we read the passage in which Scripture says to Israel, How long will you go about, O you backsliding daughter (Jeremiah 31:21)? Surely a time will come when she will be consumed by her yearning for the presence of the Holy One blessed be He, Then when the children of Israel repent, the Holy One blessed be He, will provide them with what they yearn for. No, more, the heavens will drop down sweet wine for them, as is said, And it will come to pass in that day, that the mountains will drop down sweet wine (Joel 4:18). Here the words drop down allude clearly to prophecy, of which it is said, Son of man drop your word toward the south, and prophecy (Ezekiel 21:2). The rabbis continue saying, “But as for me, All the day long have I been plagued, and chastened every morning (Tehillim / Psalms 73:14). Therefore He returns His people; and waters of fullness are drained out by them (Tehillim / Psalms 73:10).” What does it mean that the waters of fullness are drained out by them? The NASB translates Tehillim / Psalms 73:10 to say 73:10 Therefore his people return to this place, And waters of abundance are drunk by them. (NASB) The Aramaic Targum states, 73:10 Then he turns against the people of the Lord, to rule them; and they will smite them with hammers, and cause many tears to flow from them. (EMC) and the Septuagint states 73:10 Therefore shall my people return hither: and full days shall be found with them. (LXX) There is quite a degree of variation in the way in which this verse is interpreted (translated). According to the midrash, this may be a reference to the people of God who are drawing near to the company of the wicked. The midrash interprets the people to be God’s people (His people), who have their thoughts revolving around the prosperity of the wicked, and are caused therefore to shed tears in abundance (Aramaic Targum). Based upon the Hebrew text (י לָכֵן יָשׁיּב [יָשׁוּב] עַמּוֹ הֲלֹם וּמֵי מָלֵא יִמָּצוּ לָמוֹ:) the word לכן (lachen, “therefore, thus”) suggests “as a result thereof,” the people will return stricken (הֲלֹם), and the waters of fullness will be wrung out, may be the way in which the people draw near to the wicked and begin to emulate unrighteousness for the purpose of increasing their prosperity. This is a very strong temptation to God’s people, but the end is not well for the Lord chastens those who are His. Because of the prosperity of the wicked, and the afflicted state of the righteous, the people of God will be under a strong temptation to return and many will actually return to the company of the ungodly, which they had forsaken, in order to share in their prosperity. As a result of these things, the waters of abundance (a full cup) will be wrung out to them, they shall bring upon themselves many chastisements and troubles, and shall be oppressed with grief and sorrow for their sin. Rabbi Simeon said in the name of rabbi Simeon the Pious, In this world if a man goes about gathering figs on a Shabbat, the fig tree says nothing at all; but in the time to come, if a man should go to glean a fig tree on a Shabbat, the tree will call aloud to him and say, It is the Shabbat! In this world, if a man goes to do the service of his bed while his wife is menstruating, his bed will not hinder him; but in the time to come, if a man desire to go to his wife while she is menstruating, the very stone in the wall will cry out and say, She is Menstruating! Midrash Tehillim 73, Part 4 concludes saying, “Therefore, we read the passage in which Scripture says to Israel, How long will you go about, O you backsliding daughter (Jeremiah 31:21)? Surely a time will come when she will be consumed by her yearning for the presence of the Holy One blessed be He, Then when the children of Israel repent, the Holy One blessed be He, will provide them with what they yearn for. No, more, the heavens will drop down sweet wine for them, as is said, And it will come to pass in that day, that the mountains will drop down sweet wine (Joel 4:18). Here the words drop down allude clearly to prophecy, of which it is said, Son of man drop your word toward the south, and prophecy (Ezekiel 21:2).” The danger of the one who backslides, is the idea that one does not turn from their sins, does not perform Teshuva (repent), and seek the Lord. The midrash looks optimistic of the one who backslides, referring to Israel who will one day whole heartedly turn and seek the Holy One blessed be He, and even yearn for His presence. The rabbis interpret repentance on a national scale as the blessings of the Lord returning to Israel saying “And it will come to pass in that day, that the mountains will drop down sweet wine (Joel 4:18).” In a similar fashion, if you are found to be sinning, it is important to repent, turn from your sin, and seek the Lord God in heaven, our Father, and Yeshua God’s the Messiah. Doing these things, couple with out faith in Him, the Lord will rain down His blessings upon us, and it will be as refreshing as the dew of heaven. Let’s Pray!